Zachary Noble, 20, loves to bake cheesecake. His specialty is orange and lemon flavored cakes with strawberry glaze. “I like to bake them in cupcake cups, making them cheesecake minis. They are a little harder to make, but the presentation is fantastic,” he said. 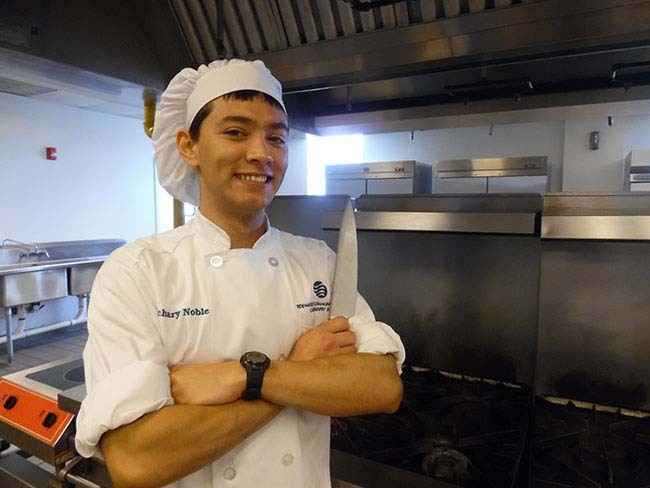 Noble, a Landstown High School graduate, is the 2015 Thomas Moss Scholar for Norfolk Campus, a distinction he earned at the end of spring semester while working toward his Associate of Applied Science in Culinary Arts. The Thomas Moss scholarship honors the namesake of the Norfolk Campus, which is known formally as the Thomas W. Moss Jr. Campus. Moss was speaker of the House of Delegates in the mid-1990s, when TCC received start-up funds from the General Assembly to put its Norfolk Campus downtown. He served for many years as Norfolk treasurer. The Thomas Moss Scholars Fund was established in 2000 by the Norfolk Faculty Senate to recognize a full-time student whose academic achievements and leadership have reached the highest levels. After considering for-profit colleges, Noble chose TCC to start his culinary career. “It was the absolute right choice,” he says. Noble’s passion for cooking started early when he and his father, Chris, earned the nicknames Cookie and Cookie Jr., while preparing meals during more than 80 Boy Scout campouts. “Cooking has always been part of me. It’s exciting to prepare for a career that reflects my passion,” he said. Noble ultimately wants to own his food truck offering baked goods. He also hopes to create wedding cakes and desserts for special events through his own catering business. To learn how you can support a TCC scholar, contact the TCC Educational Foundation at 757-822-1080 or foundation@tcc.edu.